WE'VE GOT THEM IN STOCK! When we first started working together, my partner Edwin used to joke that my superhero name should be "Perro Determinado". He came up with that because he would listen to me haggle with the cigar manufacturers and suppliers and never take no for an answer. Them: "Sorry, we don't have any in stock Mr. Panesso." Me: "Well, you're going to have to find a way to get them to me somehow else then, aren't you?" 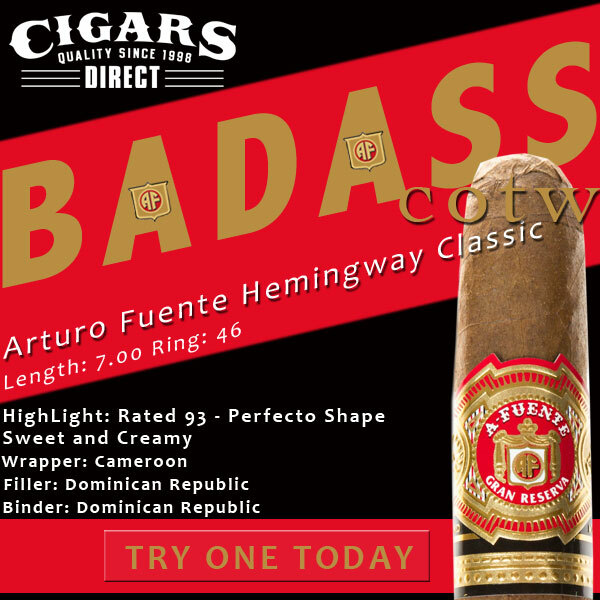 Juan's Badass Cigar of the Week is the Arturo Fuente Hemingway Classic! I kept hearing people tell me how hard it was to get this one. Then I started looking around and saw that most of the other places online were out of stock...some for more than 3 months! This cigar is amazing...sweet & creamy...with an exquisite shape and near perfect filler. "If you've never smoked an Arturo Fuente Hemingway Classic, You're missing out on one of the cigar world's premier smoking experiences." Save 13% on Arturo Fuente Hemingway Classic! 1) Try it for yourself and let me know what you think. 2) If it's a cigar that you LOVE or HATE -- let me know through our Facebook page.